Yes, I’m one of those fools that plays the lottery. 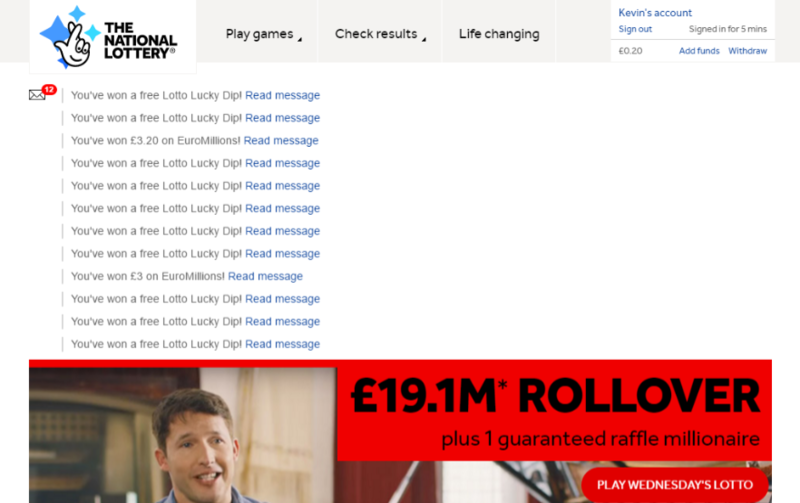 Seeing as there’s no way I’m going to queue at the supermarket to get a paper version of my could-be-worth-millions lottery ticket, that means I have to suffer the official website if I want to play. There are a fair few issues with it but I’m going to be concentrating on the messages system because it’s been driving me mad today. Before we even get to the website, any messages are already emailed to me so 99% of the time (actually probably 100%) I’ve already read them by the time I get to the site so I’ve got no inclination to click through and read them again. Even more galling is that not one of those messages has any more useful information in the body of the message than they have in the title. Okay, so the notifications take up at least 50% of the visible screen – I can still scroll past them, right? The 89 requests and 1.2Mb of content take about 4 seconds to load on my machine (and a couple of click trackers never load – thanks, AdBlock!). The main JS file (min.main-[someguid].js) is the last to load. When it does, the site jumps back to scroll position 0. So, if you start scrolling down to the action buttons when the page loads, you get about 4s until you’re thrown back up to the top. Messages are so important that, when you go to the messages page (My Account > Messages [no direct link from home]) then there’s no way to click something to mark them all as read. Also note that it is possible to win sometimes. By the time I got to this stage, I thought “Right, I’ll just open all the messages in new tabs and that’ll mark them as read“. Typical foolish optimism of a lottery player. My plan was to middle-click (non-context click) each of the message links so that it would look as if I’d read them. But, alas, it seems that there’s a (poorly coded) click listener on the message links so using the middle-click opens a new tab with the message and also opens it in the current tab. Awesome. So here I sit – defeated and broken, clicking on each message in turn so that I can clear the notifications. I’ve just asked them to delete all of mine, since I cannot do it in bulk. They said that they should disappear after 180 days but mine go back to 2014 at least, and that it’s not possible to do in bulk. After some insistence and a lecture on database & web design, they agreed to escalate it to their tech people. Fingers crossed (forgive the pun). 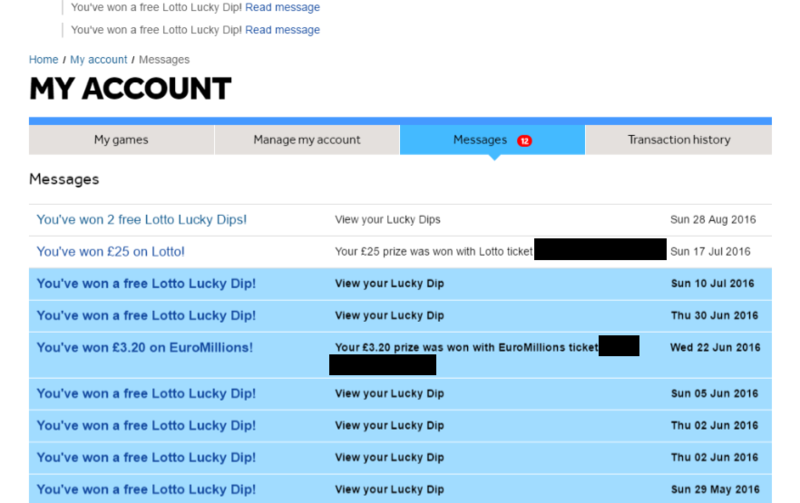 I want to be able to delete, wish Lotto could help. I want to delete all my old messages but the system won’t let me.